Many Manhattan and Brooklyn homeowners have experienced a furnace problems, often leaving them without heat for a period of time. Star Cities Plumbing & Heating offers speedy furnace repair service that will have your home warm again in no time. Our licensed contractors have extensive experience in repairing various furnace issues, as well as any plumbing problems you may have. Your Furnace is Making Loud Noises: Although most furnaces will have a quiet rumbling noise while running, be aware of any other odd noises coming from your furnace, such as grinding, screeching or loud bangs. This is usually a sign your motor or blower is in need of repair. It can indicate a range of other furnace repair issues as well. Your Furnace Won’t Stop Running: Your furnace will usually kick on several times daily depending on how you have set your thermostat; however, if you find your furnace kicking on continuously through the day, it may have an internal issue or a faulty thermostat. Your Heating Bills Increase Suddenly: An unexpected increase in your heating bill may point to a malfunctioning furnace. When your furnace has to work harder in order to heat your home, you may notice it on your next heating bill. Star Cities Plumbing & Heating repair can help with all of these furnace repair issues and more! We offer gas and electric furnace installation and maintenance as well. At Star Cities Plumbing & Heating, we understand a furnace emergency requires quick furnace repair service. That is why our plumbers are able to answer calls at all hours of the day. 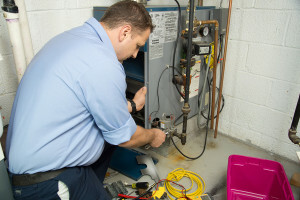 We offer around the clock furnace repair for homeowners experiencing furnace emergencies. Whether your furnace fails in the middle of the night or on a special holiday, Star Cities will be ready to take your call. Don’t live with a malfunctioning furnace any longer. Our furnace repair service is affordable and we offer a variety of payment options as well. Call us today at 800-547-1422 or contact us online any time.